Be Prepared for the Hunt: Remember to bring a sharp hunting knife, a steel or whetstone, light rope or nylon cord, plastic bags, clean cloths or paper towels, and a cooler filled with ice. Field Dress the Bird Promptly: There are major rules to follow as soon as the bird is dead. Remove the entrails and crop as soon as possible, because the grain in the crop may ferment if not removed. The heart and liver may be saved for giblets. Store in a plastic bag on ice to keep them clean and cold. The birds may be plucked or skinned in the field. 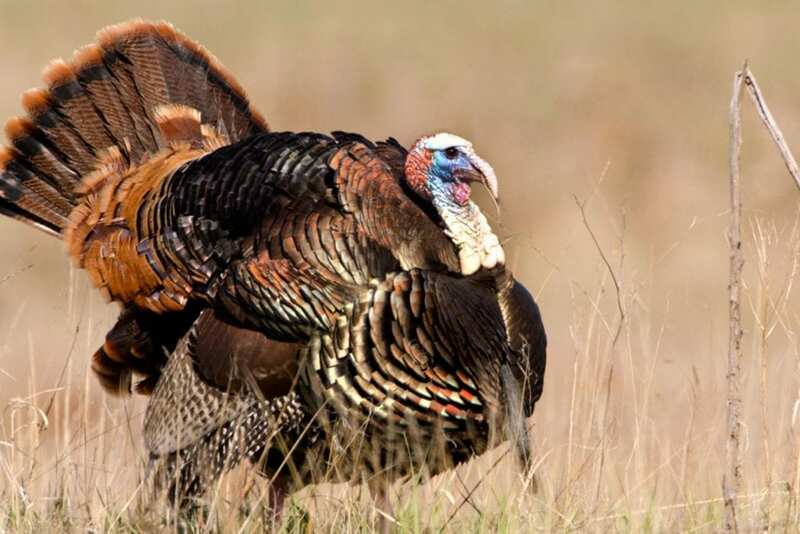 However, be sure to leave an identification mark on the bird as may be required by state game regulations. Cool the carcass quickly to retain flavor and maintain the quality of the bird. A temperature above 40 °F is meat’s worst enemy. Wipe out the cavity with a clean cloth or paper towel. Do not use grass or snow as this will contaminate the carcass. Allow air to circulate in the carcass by hanging or laying the bird in a well-ventilated place. In hot weather, place the birds individually in plastic bags and put on ice. Do not pile warm birds in a mass. Store birds in a cooler on ice out of the sun. Keep the Birds Cool During Transport: The best way to store birds is in a cooler on ice. If this is not possible, keep the car well ventilated and put the birds on the back seat or the floor. Do not transport them in the trunk because the enclosed space does not allow heat to escape from the birds. Wash your hands, knife and cutting board with hot soapy water and rinse thoroughly. To prepare ducks, cut the wings off at the joints, remove the head and pluck out the pinfeathers. Feathers may be removed by scalding the birds in hot water (145 °F). Pin feathers and down may be removed by dipping the feathered bird in a paraffin wax/hot water mixture. When wax hardens, the feathers may be scraped off. When preparing upland birds, such as grouse, pheasant, quail and partridge, skin or pluck the bird and soak in cold water for one to two hours to remove excess blood. Birds Generally Do Not Require Aging: If you wish to age birds, holding them at just above freezing temperatures for two to three days may increase the tenderness of the meat. Storage Tips: For immediate use, birds should be stored in the refrigerator at 40 °F or less and used within three days. For long-term storage, the whole cleaned carcass or individual parts may be frozen at 0 °F or lower. Do not freeze birds without plucking and cleaning them first. Freeze meat while fresh and in top condition. The advantage of packaging parts instead of the whole bird is that bloody spots can be eliminated by cutting out or rinsing out with cold water. Parts also fit conveniently in your freezer. Parts may be boned, and the carcass and neck used as a soup base. Use moisture/vapor-proof wrap such as heavily waxed freezer wrap, laminated freezer wrap, heavy-duty aluminum foil or freezer-weight polyethylene bags. Wrap tightly, pressing out as much air as possible. Label the packages with the content and date. Use frozen packages within 6 months for best eating quality. Thaw birds in the refrigerator or microwave. Slow thawing in the refrigerator 12 to 18 hours helps to tenderize the meat and prevent bacterial growth. Microwave-thawed food should be cooked immediately. Other thawed meat should be used within one to two days. Keep raw food and cooked food separate. Fish-eating ducks (those with pointed or serrated bills) may need soaking or marinating. Use a marinade high in acid such as lemon or lime juice, vinegar, wine or buttermilk. You may soak older birds in a solution of ½ teaspoon salt and 1 tablespoon vinegar per quart of cold water for 4 to 12 hours in the refrigerator. Wild game birds should always be cooked thoroughly. Check visual signs of doneness; juices should run clear and meat should be fork-tender. However, recent research has shown that color and texture indicators alone are not reliable. Using a thermometer is the only reliable way to ensure safety and to determine the “doneness” of meat and poultry. To be safe, a product must be cooked to an internal temperature high enough to destroy any harmful bacteria that may have been in the food. When cooking whole poultry, the thermometer should be inserted into the thickest part of the thigh. If cooking poultry parts, insert the thermometer into the thickest area, avoiding the bone. If stuffed, the center of the stuffing should be checked. All poultry and stuffing must reach 165 °F to be safe. For reasons of palatability and acceptability, poultry may be cooked to a higher final temperature. The age of the bird determines the cooking method. Young birds have lighter legs, soft breastbones and flexible beaks. Old birds have darker, hard-skinned legs, brittle breastbones and inflexible beaks. Wild duck meat is darker and somewhat dryer than domestic duck. To retain or add moisture when roasting older or skinned birds, cover the breast with strips of bacon or side pork and roast in a covered pan. Game birds may be prepared like chicken. Dry cookery methods, such as frying, are appropriate for young birds. Moist cookery methods, such as stewing or braising, are appropriate for older birds. Ducks and geese may be baked, barbecued, breaded, broiled, fried, and combined in casseroles, chop suey, creoles, gumbos and gravies. To decrease the distinctive taste of some wild game, trim off as much fat as possible. In roasting or broiling ducks use a rack to keep them free of their own fat and do not baste with fat. Remove stuffing from the bird prior to storage, because stuffing is a good growth medium for microorganisms. Use leftovers within one or two days, or freeze for later use. Roast Wild Duck: Rub outside of duck with a slice of onion, then sprinkle with salt and pepper. You can flavor the bird and absorb strong flavors by placing a quartered peeled onion, grapes, quartered apples or potatoes, and a small bunch of celery in the cavity during roasting, but discard this stuffing before serving. If ducks are lean or have been skinned, place two or three strips of bacon or salt pork on each breast and secure with toothpicks. Place ducks on a rack in a covered roasting pan and bake in a 325 °F oven for three hours or until the internal temperature is 165 °F. If ducks need basting, use orange juice, melted butter, or melted butter and red wine rather than pan drippings. Roast Wild Goose: The “flavor dressing” of apple, onion, potatoes and celery, as described for duck, can be placed in the bird during roasting. Place the goose on a rack in an uncovered roasting pan and bake in a 325 °F oven for three hours or until tender. Baste frequently with pan drippings. You can insert a meat thermometer into the thickest part of the thigh muscle, without touching bone, to determine internal temperature. Goose is safely cooked when the internal temperature is 165 °F and well done at 180 to 185 °F. Serve with a tart jelly or relish. Dressing for Duck or Goose: We recommend baking dressing separately to avoid any chance of hazard from bacterial growth. Bake in a covered casserole in the oven while the bird is roasting. If you decide to stuff the birds, do so just before placing them in the oven, and have all ingredients hot before stuffing the birds. Use a meat thermometer to be sure internal temperature of the dressing reaches 165-170 °F. Microwave Directions for Duck or Goose: Place duckling or young goose in an oven-cooking bag (or in a covered pot). Microwave on high 6 to 7 minutes per pound. Crisp in 500 °F conventional oven 10 to 20 minutes. When microwaving parts, arrange in a dish or on a rack so thick parts are toward the outside of the dish and thin or bony parts are in the center. Allow 10 minutes standing time for bone-in goose or duck, 5 minutes for boneless breast. Use a meat thermometer to test for doneness in several places, and check for visual signs of doneness. Always use a thermometer to check proper internal temperatures. All poultry is safely cooked when an internal temperature of 165 °F is reached, but may be cooked to higher temperatures for reasons of acceptability and palatability. Cooking times are only estimates.